Time flies when you’re having fun! It’s hard to believe we’re closing out Week Six – and what a week it was. Project Trio kicked off this week from the Festival stage. Band Majors as well as Dance Majors and Minors rounded out the Amphitheater performances. Energy on campus was high thanks to tons of in-studio presentations and the annual Sewing and Fashion Design showcase. We took “The Big Plunge” with Artist In Residence Pedro Lasch – which culminated in a kid-made whirlpool in our refreshing shallow pool. Usdan Theater students transported us to “1776”; flew us to Neverland with “Peter Pan”; until we landed “Somewhere That’s Green” thanks to “Little Shop of Horrors” and “The Secret Garden.” But, the magic didn’t stop at our yellow gate: Matinee Idols’ took a trip to see “Mean Girls” and Sustainable Design and Rock On students participated in the Solar NightWalk with Olafur Eliasson’s Little Sun on Governor’s Island. Check it out here along with some other sights and sounds from campus this week. Hey U! Just as Usdan’s classes and campus have evolved over the years, so has its logo. The original incarnation was a clear reference to the 140-wooded acre campus, featuring a lush green tree line and the then-name fully spelled out: Usdan Center for the Creative and Performing Arts. When the 80s arrived, the logo was modernized (or at least for that time! ), using graphic elements and bright colors which were nods to the various disciplines – including the use of a musical note at the center, as the ‘d” in Usdan. Very 80s, indeed! In 2011, the more casual “This Summer” logo came to life. Today, Usdan’s logo ratchets up its connection to community and reference to our 100 classes with the ”U” designed to represent all aspects of camp — from music to swim; nature and writing; drama to art; dance to archery. And, every year, we ask students to submit their designs for the newest U that best depicts a special element or aspect of Usdan. 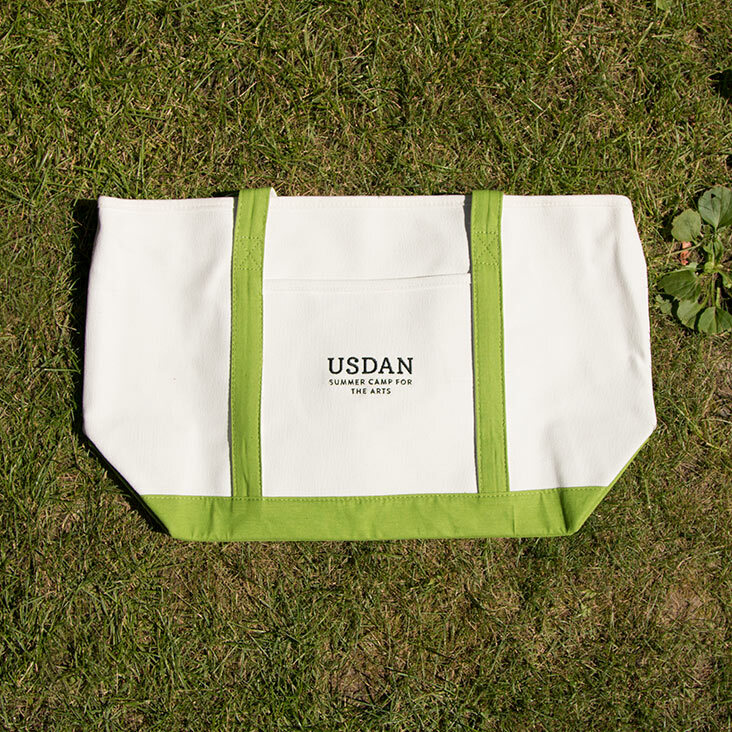 Check out our boat tote in the Usdan Store! You can order this and more at the Usdan store online or at the camp. We close out our 50thanniversary season on a high note with the last of our student performance and showcases, Art Open Studios, the second Quidditch tournament of the summer, and our annual end of year Junior Parade and Senior Carnival. The full list here. *Seniors who want to swim or participate in water activities should bring a swimsuit and flip flops. Last week we asked about the friends your kids have made this summer. We’re thrilled to hear that new friendships and long-lasting ones are one of the best things to come out of a summer at Usdan. As we start to wind down the summer, we’d love to hear what your kids thought of their classes. What they loved, what they think we can improve. Tell us at tellus@usdan.org.